William M Hoffman’s ‘As Is’ is a powerful show that follows a young man in 1980s New York as he is diagnosed with HIV. It’s known as the first AIDS play, and this production celebrates its 30th anniversary. The show’s handling of its topic is at times hard hitting, with some emotionally raw performances from all of the cast, many of whom perform with watery eyed despair throughout the show. At 70 minutes without an interval, there is welcome relief with some excellent comedy, particularly from Jane Lowe’s Irish ex-nun who recounts tales from the hospital bedside in her self-confessed day job of ‘saint’. 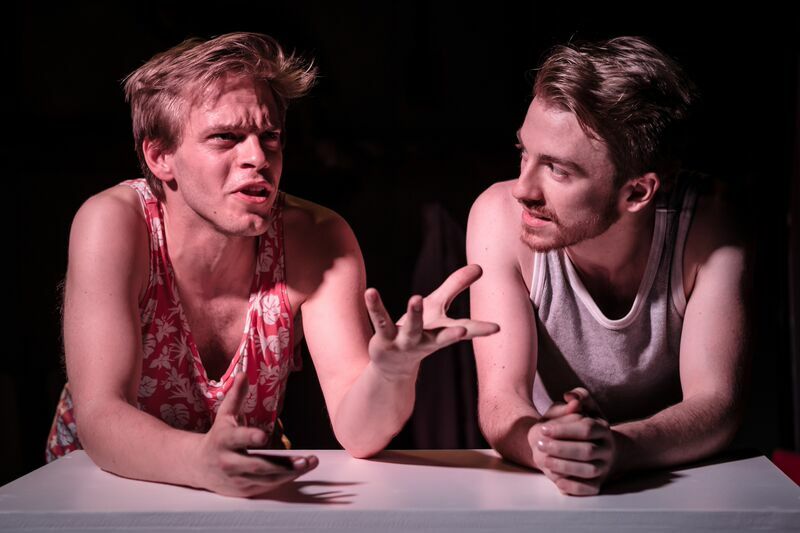 The central relationship is a complex one, handled touchingly by Stephen Webb and David Poynor who fling between unrequited love, dependence and sexual abandonment naturally. The show doesn’t stay still for too long either. Director Andrew Keates uses the ensemble throughout the show to keep a high pace. The play opens with the whole company on stage, adding physicality and energy to the opening dialogue. There are moments of devastatingly raw emotion, and these contrast sharply with the crude camp comedy that is squeezed in between. I was greatly moved by a hospital bed scene between two brothers. As the company take you back to the 1980s complete with authentic moustaches, discussing ‘the combination of quiche and leather’, they simultaneously remind us of how far we’ve come in the fight against HIV and AIDS and also how far, with an estimated 34 million people living with it around the world, there still is to go.